Франциско Хосе де Гойя. Mascaras de B. Tambien ay mascaras de Borricos Literatos (Masks of B. There are Also Asses Who Put on the Mask of the Literati). 1796-97. Drawing from the Madrid Album ( B.72); Chinese ink, wash, 23.5 x 14.5 cm. Private collection. Mascaras de B. Tambien ay mascaras de Borricos Literatos (Masks of B. 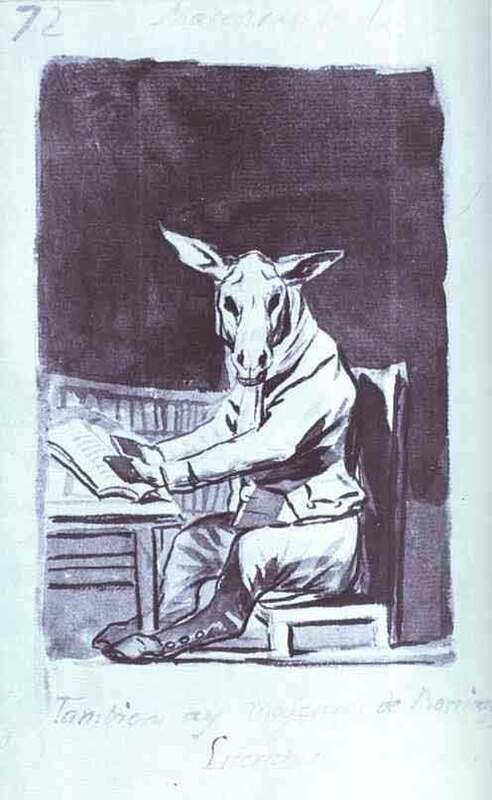 There are Also Asses Who Put on the Mask of the Literati). 1796-97. Drawing from the Madrid Album ( B.72); Chinese ink, wash, 23.5 x 14.5 cm. Private collection.